As the University of Pretoria (UP) moves ahead in its transformation agenda, it will focus on providing access to its high-quality education to as many South Africans and Africans as possible. This is because high-quality education contributes to the improvement of African futures. This was said by Professor Tawana Kupe, UP’s newly appointed Vice-Chancellor and Principal, at his inauguration ceremony on Saturday, where he outlined his vision for the institution for the next five years. Prof Kupe took up his position on 14 January 2019 and is the 13th vice-chancellor and principal and the first black African to be appointed at this 111-year-old institution. The ceremony was attended by, among others, high-profile business people, government officials, vice-chancellors of other universities, as well as representatives of the University’s various stakeholders. Providing access to large numbers of students is key to the University addressing histories of exclusion and marginalisation. “It’s the opportunity to rise to the occasion to educate and skill our continent,” as education provides a means to escape poverty and it enables social mobility. UP aims to grow its total student enrolment from the current 55 000 to 75 000 by 2025. Meanwhile, the majority of its students are black, of whom 55% are women. To ensure that quality is maintained, UP will craft strategies to improve staff / student ratios. However, “transformation of the academic staff and senior management has been slower,” explained Prof Kupe. Strategies to quicken diversification include affirmative action and bespoke support for career development and training. He said that UP will continuously reform and transform its curriculum. Curriculum transformation will be largely driven by a decolonising imperative, “which asserts that knowledge, which liberates and contributes to the creation of new futures, is produced at multiple points globally and not just at centres of imperial power”. UP also aims, through its high-quality teaching, inquiry-led and innovative participatory learning “to develop in our students, critical thinking and analytical skills, high-level research and writing skills, adaptability to change, resilience, creativity and the ability to acquire … a culture conducive to life-long learning,” he said. He pointed out that the University is one of the leading research-intensive universities in South Africa and Africa and has a rising international profile as it is in the top 2% of universities in the world. It intends to improve the quality of research in more areas and to support new emerging areas. Four things are core to its strategies: innovative research ideas; leading, emerging and a new generation of researchers; partnerships and collaborations and world-class infrastructure. He paid tribute to Professor Mashudu Tshifularo, who pioneered the world’s first middle ear transplant using 3D-printed bones, which has enabled a person to regain his hearing capacity. The second is the Javett UP Art Centre, which will advance interdisciplinary knowledge of the arts, art history, curation, art education, conservation and heritage preservation. The third is the Engineering 4.0 Facility, which will have an integrated laboratory and live traffic facility that will enable the Faculty of Engineering, Built Environment and Information Technology to combine its capacity in road engineering, sensor technologies and data science to further the goal of an intelligent transportation system. Meanwhile, the Mamelodi Social Innovation Space has innovative developments unfolding - it enables access for students who do not initially earn entry to University programmes but who have the potential to do so if provided with nurturing and supportive programmes. 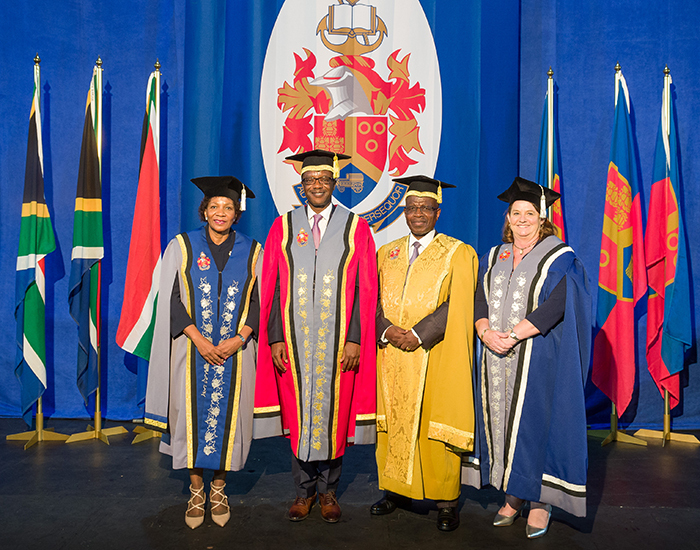 To achieve his vision, Prof Kupe said the University will craft an advancement strategy focused on fundraising for infrastructure for teaching, learning and research, academic and student talent and innovative research programmes. And makes a significant contribution to changing the world.